Everyone loves Chef Hemant Oberoi and are big fans of his world-class culinary skills, so naturally we were super stoked when we heard about his first flagship restaurant in Mumbai. 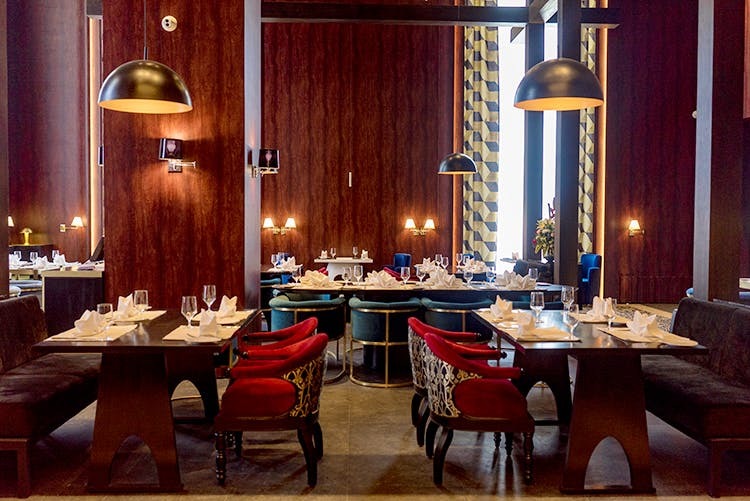 Named after the chef himself, Hemant Oberoi at BKC will take diners on a global culinary journey with European, Peruvian and Asian inspired dishes. Chef Hemant Oberoi certainly needs no introduction. For over 40 years now, the Chef has been introducing Indian diners to cuisines from across the world and over time, he has certainly carved a nice for himself. The man behind Souk, Golden Dragon, Wasabi, Zodiac Grill and many, many more successful restaurants, has certainly raised the bar in the culinary industry. After launching over 100 restaurants all over the world, he has launched his signature restaurant in BKC, which is named after himself. With wooden pillars, a high ceiling and plenty of room to move around, this restaurant has been designed to please your eyes. The restaurant is huge, the interiors are plush and the dominant shades of regal wood and gold make this a perfect fine dining experience. They also have a private dining area that can seat a minimum of six people. In the menu, there will be European, Peruvian and Asian inspired dishes. We’re super excited about tasting the food from their delicious-sounding menu. And like they say, pictures speak a thousand words and we’re only getting hungry looking at these. This fine dining restaurant is definitely worth a visit and there’s no doubt about that.